Pour your glue into a bowl and add some food coloring. Mix it up. 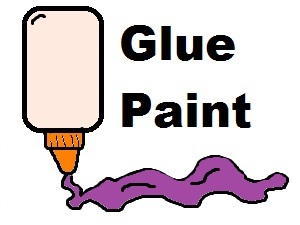 Then let the kids have painting with this fast easy paint recipe. Let them make designs or Bible people with the glue. If you are working with a lot of kids in Church then try putting the glue in some of those plastic bowls they sell at walmart. This make good containers to mix food coloring in. The kids can use construction paper or wax paper.